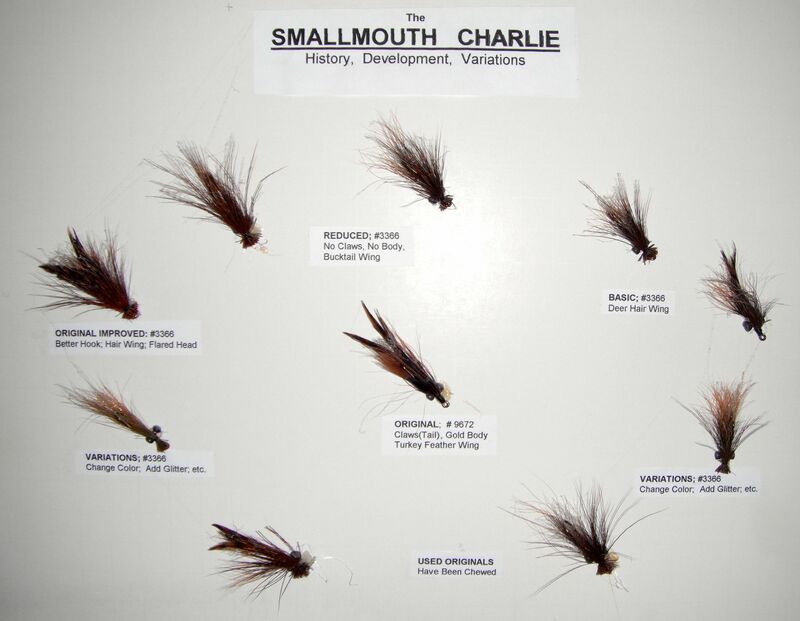 Like most fly tiers, I spend a lot of time at the vise fiddling with color options of proven fly patterns. 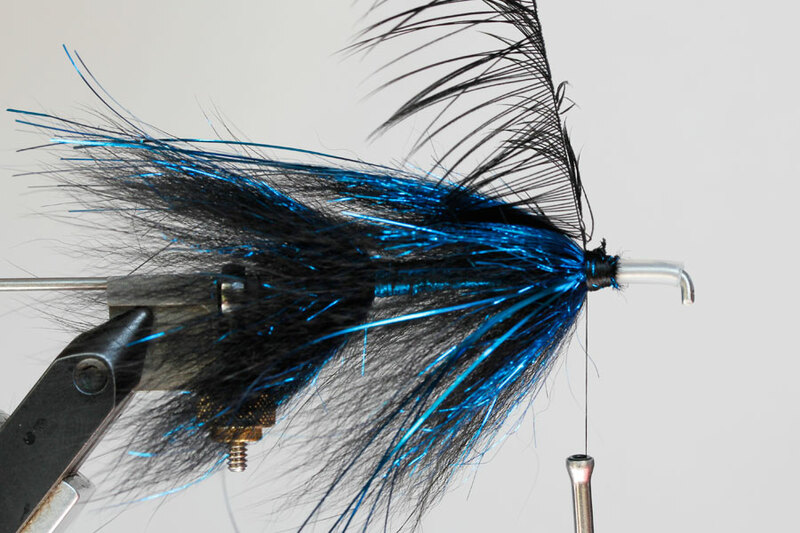 As both a design student and angler, I appreciate the value of contrasting colors in fly patterns because contrast can bring both a painting and fly to life. 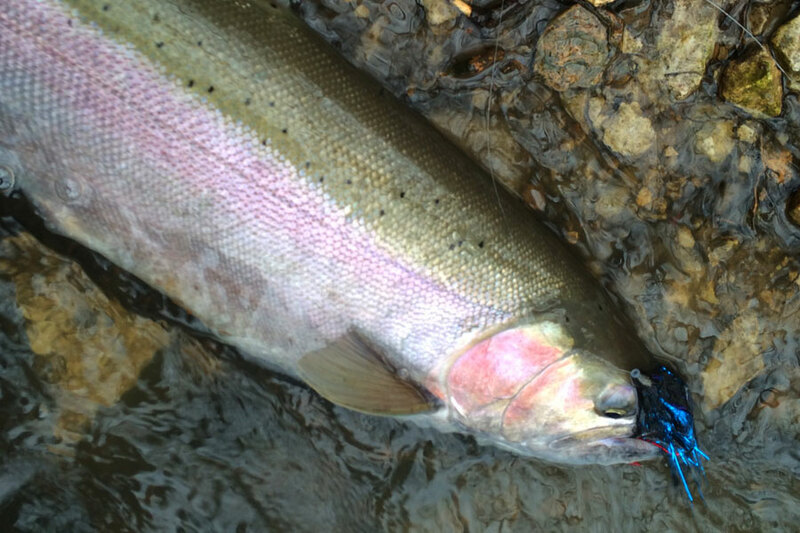 In steelhead circles, purple has long been the successful, complimentary color of black. 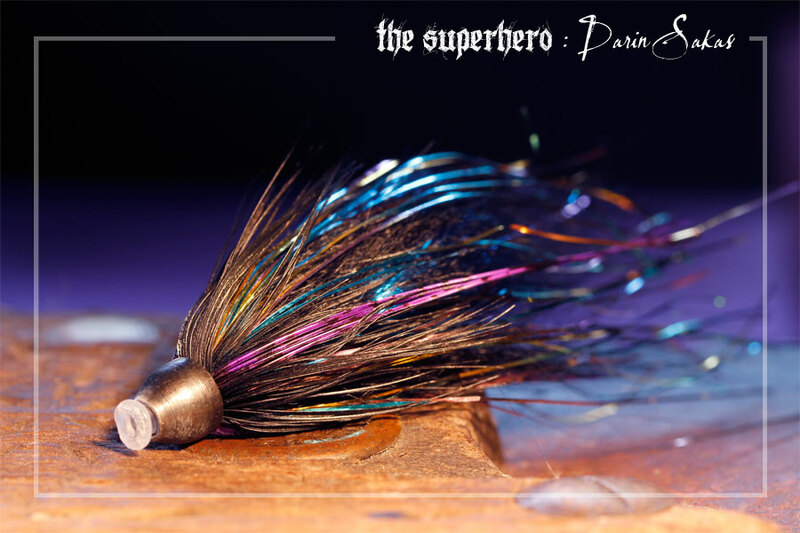 As luck would have it, as I was tying a batch of Intruder-style tube flies, I ran out of purple material. 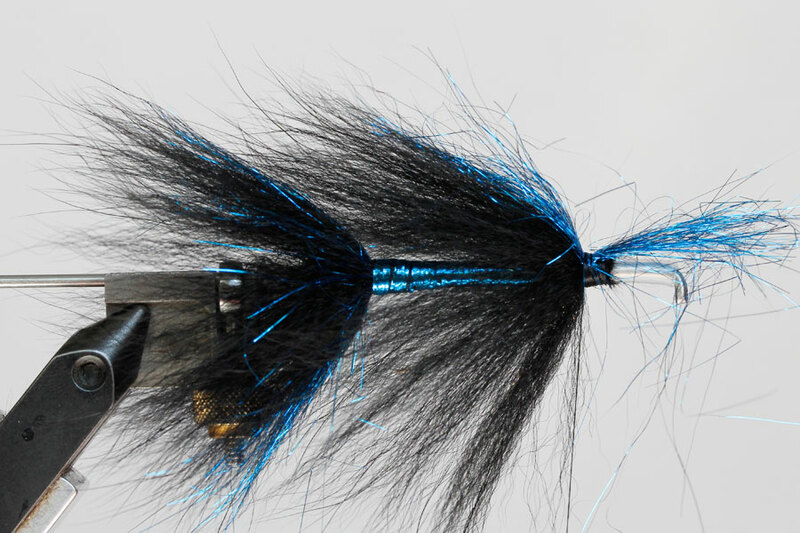 Relying on my design background and countless years of browsing Marvel and DC comic books, I decided that if blue could be used as the highlight color in the hair of every, “Superhero,” it would surely be acceptable in a fly pattern. My first day fishing the “Superhero” fly resulted in three lake-run brown trout — including the largest brown I’ve ever brought to hand. Since that day, the fly has performed consistently in ultra-clear water, to water that runs thick as chocolate milk. 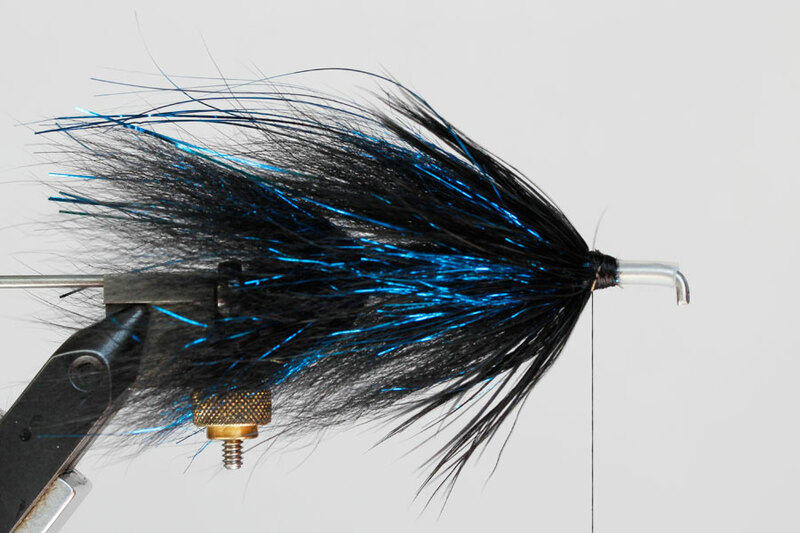 With regard to fall, winter and spring steelhead, I can assure you, at 3 1/2 to 4 inches, this fly will either scare the hell out of fish, or cause them to hit it like a freight-train — there is absolutely no in-between; in any season or any water condition. I swing this fly deep and aggressively to cover a lot of water. I let it empty the pools of sissies and search for the villains that will attack it – and it does a fine job of that. 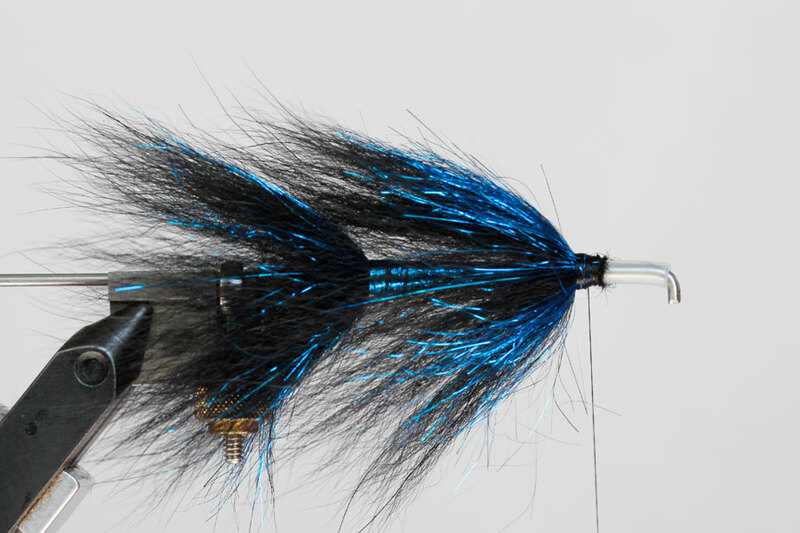 I’m a firm believer that fly color is specific to waters being fished. While forage base differs from one river to another, I believe color effectiveness is more determined by water color, depth and the color of the stream bed — which determine the backdrop of color behind a fly and how light reflects off the fly. 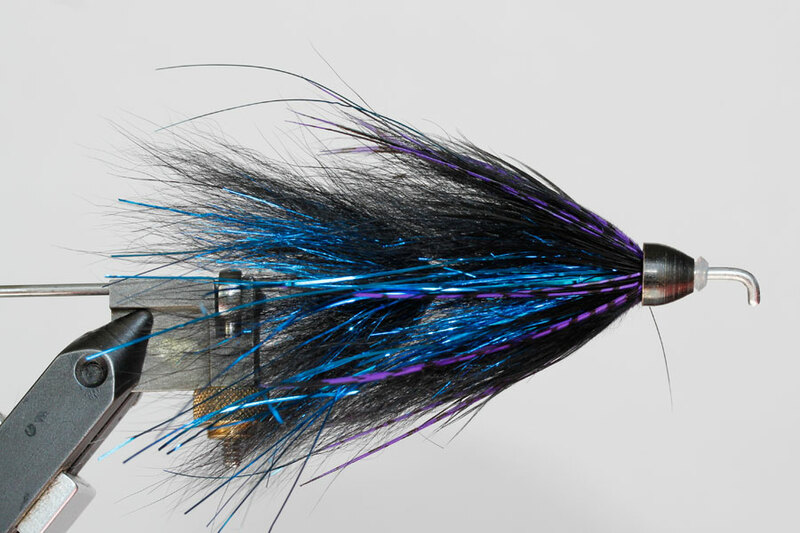 I don’t know that this fly will perform as well in the tannic waters of Michigan and Minnesota’s north shore, or in the green running tributaries of Lake Erie. 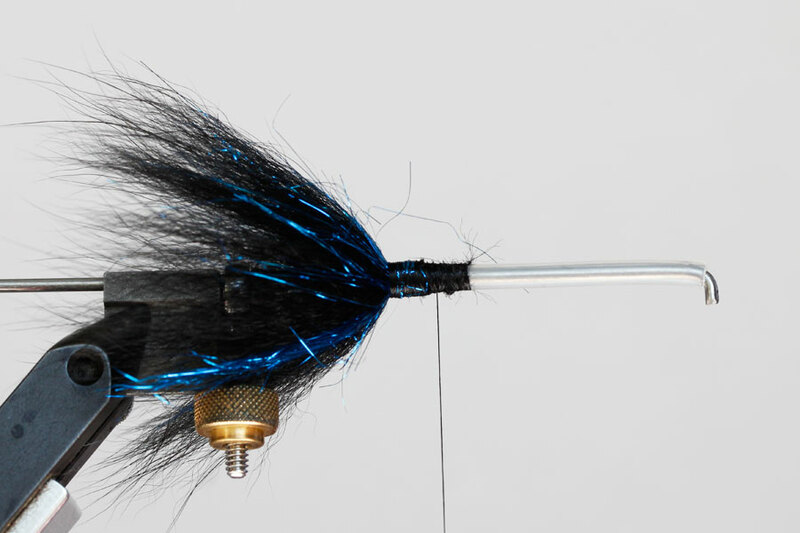 What I can definitively say is, in sediment-stained waters of southeast Wisconsin, the performance of this fly has been nothing short of outstanding for me on a deep swing. I hope that you find the same luck with it that I have. STEP 1 – Trim 2-inch section of tube, lightly melt tag end and slip junction tubbing over tube. Secure with thread and then cover with a generous dubbing ball of Black Ice Dub. The dubbing ball helps flare the fox tail when submerged — allowing current to bring life to materials. Do not underestimate the importance the dubbing ball plays in Intruder patterns. STEP 2 – Secure a generous amount of Arctic Fox Tail behind the dubbing ball with 3 loose wraps of thread. Work the hair evenly around the tube by twisting and flattening the fibers. 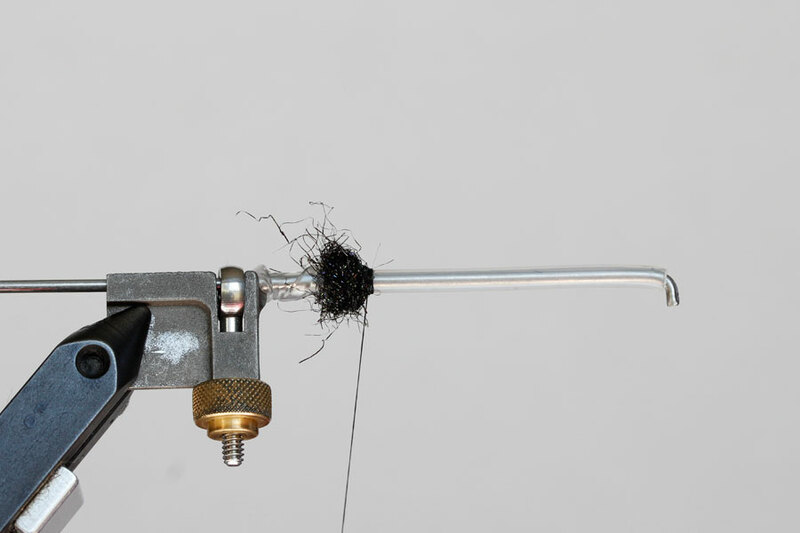 While some prefer to use a dubbing loop for arctic fox, I find the results are extremely uneven and unpredictable — which in extreme cases can make the tube fly spin on the leader like a propeller. 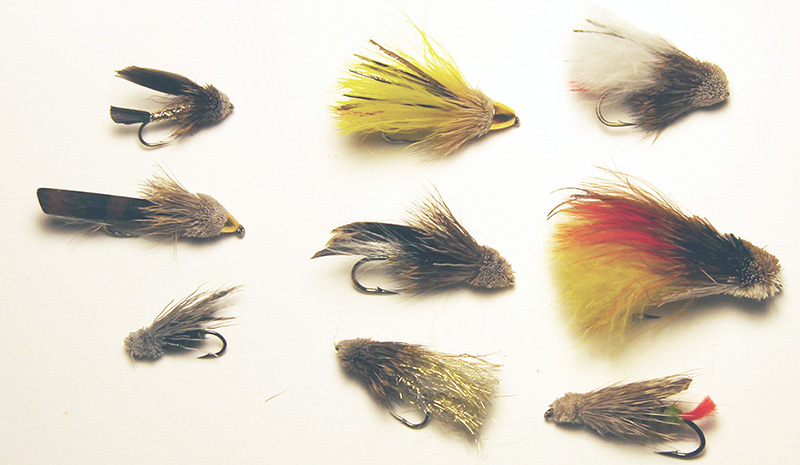 While I dub foxtail on sparse, cut-shank intruders that method fails me on tubes. Once spread evenly, secure with a few tight wraps, trim excess. Be sure you have tight wraps against the dubbing ball to flare material. STEP 3 – Pinch a frugal amount of Steelie Blue Dub from the package, keeping the fibers straight, lay on top of the tube with half of the dubbing over the foxtail and half along the tube (see example in step 7). Secure with a few wraps then fold excess back over the sides. 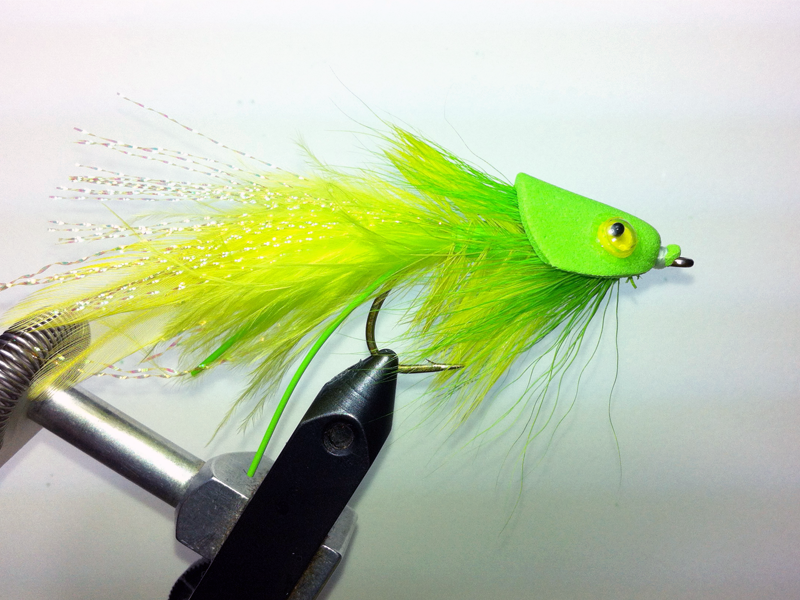 Repeat on the bottom of the fly. STEP 4 – Using three to four strands of Blue Flashabou, wrap tinsel to cover tube within a 1/2″ of the end of the tube (will take two steps to cover). STEP 5 – Repeat dubbing ball. STEP 6 – Repeat Arctic Foxtail — be sure foxtail slightly overlaps the foxtail in rear. 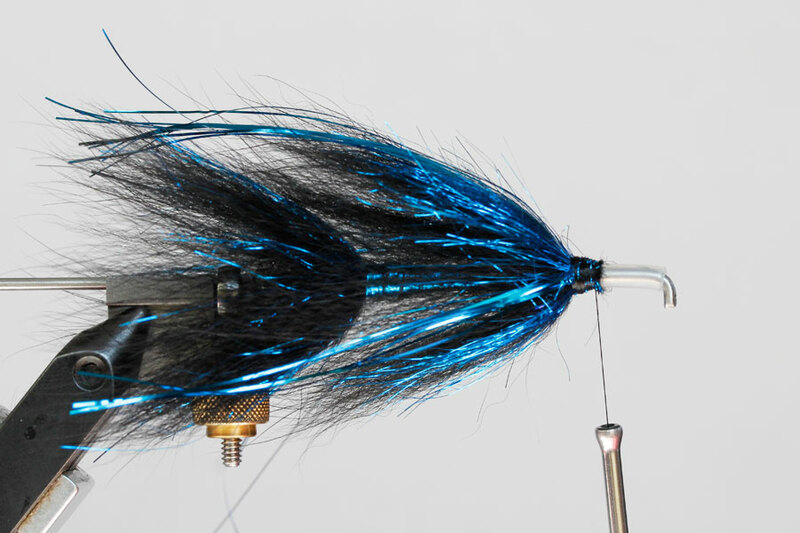 STEP 7 – Secure Ice Blue Steelie dub as done in rear but use a bit more material in front half of fly. 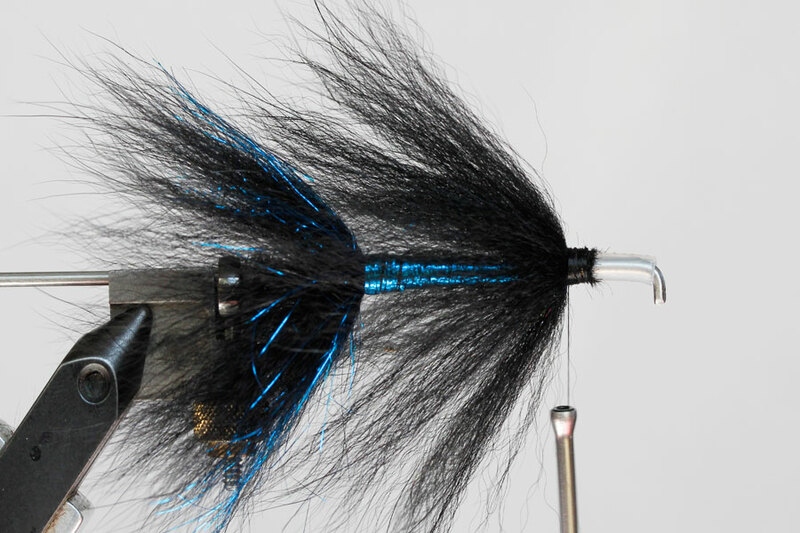 STEP 8 – Fold Ice dubbing back over fur, secure and repeat on bottom of fly. STEP 9 – Trim 8 pieces of Flashbou and tie on top half of tube. Repeat on bottom half. STEP 10 – Tie in large, black Schlappen feather, fold and tie in collar style ( 4-6 wraps ). STEP 10-a – Finish collar and clean up head with thread. 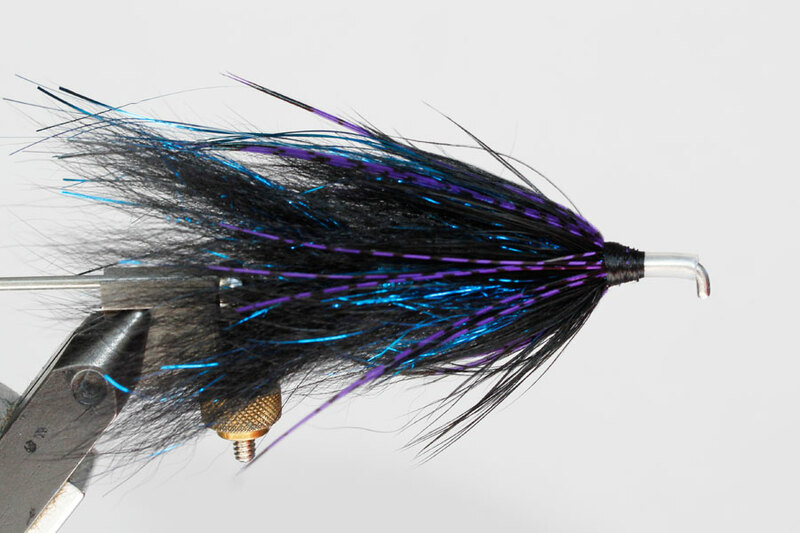 STEP 11 – Tie in fibers of purple Lady Amherst Pheasant tail around collar (evenly spacing around fly). My realistic angler perspective is that this step is likely optional but the artist and superstitious angler in me always ties it in and I fish the fly that has worked for me. STEP 12 – Apply a generous amount of Zap-A-Gap to the thread an secure cone head. I should note that I prefer a thick bead on the melted plastic to secure the cone. 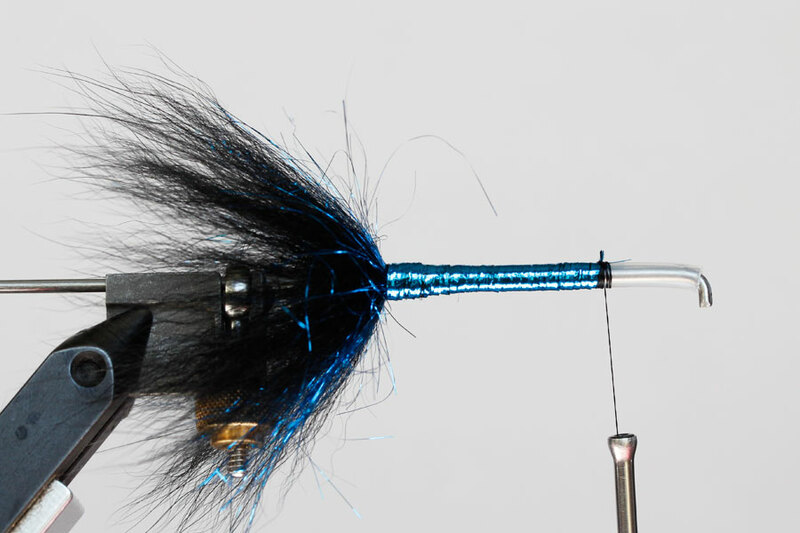 While you can melt a thin, pretty bead near the cone, it does not hold up to vigorous use — one cast on a rock in icy water can chip the plastic and leave you with a fishable fly that has a sliding weight. 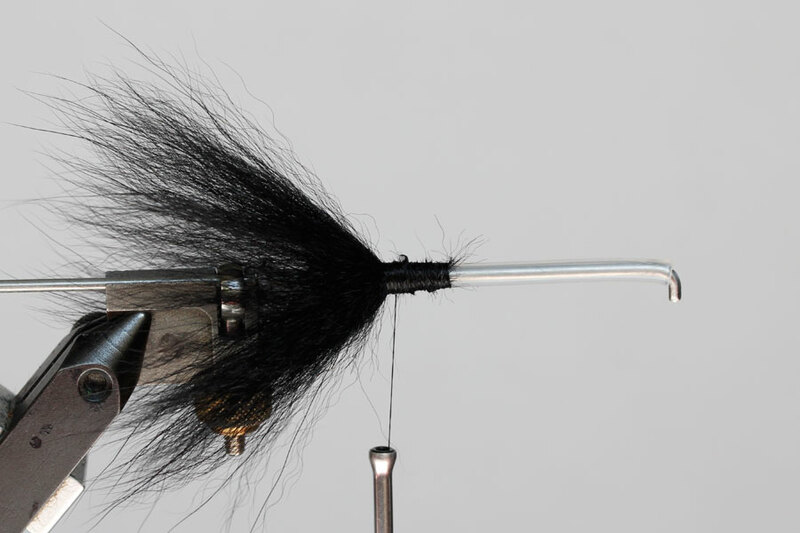 I err on the side of durability, simply because a fly that takes this long to tie should get a lot of fishing miles. I should also note that tube brands all melt differently. There are many color tube variations out there but most of color tubes don’t melt well and shrink back instead of making a durable bead. You can experiment if you like but the brands I have mentioned here melt well and fit in the conehead mentioned. With very little standardization in tube materials, half the the puzzle is finding brands that play nice together. Enjoy the pattern! I hope it fishes well for you. 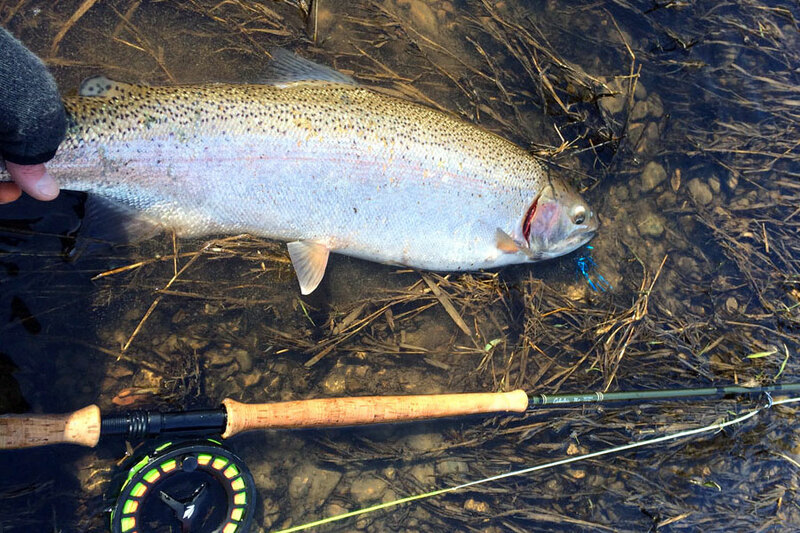 ← Skinny Water Steelhead – Swing Control and Direction.